McGill- Queen’s University Press 2017. Shaping individual and collective war memories through the art of commemoration. War Memories explores the patchwork formed by collective memory, public remembrance, private recollection, and the ways in which they form a complex composition of observations, initiatives, and experiences. Offering an international perspective on war commemoration, contributors consider the process of assembling historical facts and subjective experiences to show how these points of view diverge according to various social, cultural, political, and historical perspectives. Encompassing the representations of wars in the English-speaking world over the last hundred years, this collection presents an extensive, yet integrated, reflection on various types of commemoration and interpretations of events. Essays respond to common questions regarding war memory: how and why do we remember war? What does commemoration tell us about the actors in wars? How does commemoration reflect contemporary society’s culture of war? 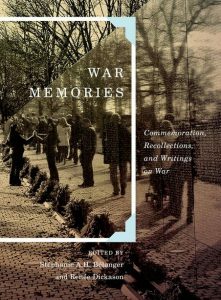 War Memories disseminates current knowledge on the performance, interpretation, and rewriting of facts and events during and after wars, while focusing on how patriotic fervour, resistance, conscientious objection, injury, trauma, and propaganda contribute to the shaping of individual and collective memory. Contributors include Joan Beaumont (Australian National University, Canberra), Gilles Chamerois (University of Brest, France), Subarno Chattarji (University of Delhi, India), Nicole Cloarec (Rennes 1 University, France), Corinne David-Ives (European University of Brittany – Rennes 2, France), Jeffrey Demsky (San Bernardino Valley College, California), Sam Edwards (Manchester Metropolitan University), Georges Fournier (Jean Moulin University, France), Annie Gagiano (University of Stellenbosch, South Africa), David Haigron (Rennes 2 University, France), Judith Keene (University of Sydney, Australia), Melissa King (San Bernardino Valley College, California), Christine Knauer (Eberhard Karls University Tübingen, Germany), Liliane Louvel (University of Poitiers), Michelle P. Moore (Canadian Army Doctrine and Training Centre, Kingston, Ontario), John Mullen (University of Rouen, France), Lorie-Anne Duech-Rainville (Caen University, France), Elizabeth Rechniewski (Australian Research Council Discovery Project), Raphaël Ricaud (University ‘Paris Ouest Nanterre La Défense’, France), Laura Robinson (Royal Military College of Canada), and Isabelle Roblin (Université du Littoral-Côte d’Opale, France).